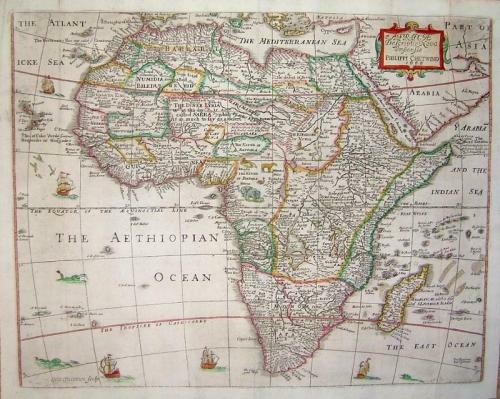 Title: "Africae, Descriptio Nova...Philippi Chetwind 1666". From Peter Heylin, Cosmographie in foure Bookes, London: Chetwind, 1670 (the Third Edition of this book but the first such that bears Chetwind's name). This map shows all of Africa, parts of Arabia and the Persian Gulf, Madagascar and some other islands in the Indian Ocean. Chetwind was a well known publisher in London in the 17th century and was partly responsible for the production of the Shakespeare Third Folio. The maps in Cosmographie were engraved by William Trevethen. The condition is very good with a good imprint. There is a short 2" nearly invisible repaired tear to bottom (a little left of center fold), short repaired splits at the fold (outside the image area) otherwise a clean crisp map with good margins.